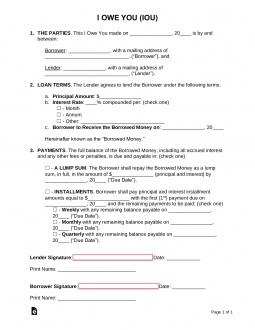 An IOU Form, otherwise known as an “I Owe You” or “Debt Acknowledgment Form” is used to record an individual’s or entity’s debt with another party. An IOU is a simple solution when two parties want to record a transaction in writing without the hassle of complicated paperwork. People who tend to use IOUs have a common ground of trust, typically business partners, friends, or family members. When most people think of an IOU, the thought of a napkin with scribbled words inscribed on it comes to mind. Due to how IOUs have been portrayed in Hollywood, an IOU does not have the greatest reputation as being a legally binding document. However, an IOU can be a powerful document when coming to an agreement. As long as there is a lender and borrower in a transaction, an IOU can be used to set the terms of repayment. Create a powerful and beautiful looking IOU form by downloading our free template or let us help you create a professional IOU form by using our fillable software. Enter the name of the Debtor/Borrower (John Rogers), the Creditor/Lender (James Smith), and the amount of the loan (in written and numeric form). The next step requires information pertaining to how the loan will be re-payed. In our example, the borrower will pay back the loan with monthly installments until the loan is paid off. If the loan is being paid off with one lump sum payment without monthly installments, simply enter the amount of “$0” instead of $42 like seen in the image. To finish this step, enter the final date in which the loan must be paid and the date in which this IOU form will be signed. In order for any IOU to be legally binding, signatures from both the Lender and Borrower is needed. And in some states, a Notary Public and a Witness is needed to sign off on the IOU as well to be valid. Check with your State to make sure you are aware of the laws. If a Notary Public is not required in your State, it’s still a good idea to have it done as it will give more protection to both the Lender and Borrower but more so the Lender. The Lender must be present with the Notary when the Notary signs the IOU. To finish, enter the date signed, name of Notary Public, Governing State, and the Notary Public’s signature.